FILE - A small group of demonstrators denouncing Obamacare rally in Indianapolis, Indiana, August 26, 2013. On Thursday, Republican lawmakers scored a symbolic victory in their quest to repeal the health care law but prospects of replacing it altogether remain far from certain. Republicans in the U.S. House of Representatives secured two legislative victories Thursday in their drive to scrap and replace former President Barack Obama's health care plan amid mounting intraparty opposition. In a pre-dawn vote along party lines, after 18 hours of debate, the House Ways and Means Committee approved a Republican proposal to replace the Affordable Care Act, commonly known as Obamacare. After also working feverishly overnight and some 10 hours later, the House Energy and Commerce Committee overcame Democratic delays and approved the replacement bill, the American Health Care Act. 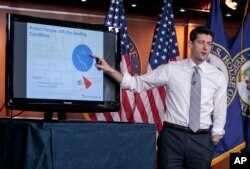 House Speaker Paul Ryan of Wisconsin uses charts and graphs to make his case for the GOP's long-awaited plan to repeal and replace the Affordable Care Act, during a news conference on Capitol Hill in Washington, March 9, 2017. As the committees finished working on the replacement bill, House Speaker Paul Ryan attempted to consolidate Republican support by hosting a briefing with reporters. "This is the closest we will ever get to repealing and replacing Obamacare," the Wisconsin lawmaker said. "The time is near. The time is now." Senate Majority Leader Mitch McConnell said earlier that legislators needed to see a Congressional Budget Office (CBO) estimate of the impact the measure would have on the federal deficit. "I think we need to know that," the Kentucky Republican told reporters at a breakfast hosted by Politico. Other lawmakers, such as Republican Senator Tom Cotton of Arkansas, maintained the rush to approve a replacement bill, particularly without budget estimates, would have long-term detrimental effects. House Republicans and White House Budget Director Mick Mulvaney both predicted a CBO estimate would be available by early next week, prior to combining two versions of the bill and presenting the result to the House Budget Committee. The prospects of replacing the current health care law are far from certain, even with Republicans in control of the White House and both chambers of Congress. Opposition to the replacement plan is intensifying among influential lawmakers who believe it is too similar to Obamacare. Those on the far right said the replacement plan fails to address conservative principles by maintaining government subsidies of Obamacare under the guise of refundable tax credits for people who buy their own health insurance. In addition to mounting Republican congressional opposition, influential health groups, such as the American Medical Association and the American Hospital Association, and the AARP, an advocacy group for older people, have come out against the Republican bill, warning it could result in a rise in the number of uninsured people. Hospitals are complaining to lawmakers that the replacement bill cuts Medicaid and other programs. America's Health Insurance Plans, which represents insurance providers, applauded the elimination of the tax penalty but warned that proposed Medicaid changes "could result in unnecessary disruptions in the coverage and care beneficiaries depend on." FILE - President Donald Trump speaks in the East Room of the White House in Washington during a meeting with House Republicans about a proposed health bill, March 7, 2017. President Donald Trump, meanwhile, is planning to go all out to get a House repeal measure approved. 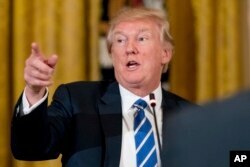 Trump met privately in the Oval Office Wednesday with conservative activists and emphasized the replacement bill was strong and imperative. The president said the biggest challenge was in the Senate, where many conservatives and moderates oppose the replacement bill for various reasons. Trump told the conservative leaders he was prepared to secure votes from holdout senators by holding campaign-style rallies in stadiums and in other large venues in the senators' home states. Republican congressional leaders have said they want to get the replacement measure on the president's desk before the Easter break in early April.